Launch Visual Studio. Go to File > New > Project > Installed > Templates > Azure Data Lake > U-SQL Project. At this point you should notice that an empty U-SQL script has been created called "Script.usql". The Submit button will run the script. The dropdown next to the Submit button says (Local). This means that Submit will run the script in Local Execution mode. In future chapters, we&apos;ll pick an Azure Data Lake Analytics account and run the script in Cloud Execution mode - but for now we will continue to locally execute all our U-SQL script. You can ignore the dropdowns that say master and dbo. They will not impact the tutorial in any way. Make sure the Solution Explorer is visible. If it isn&apos;t go to View > Solution Explorer. 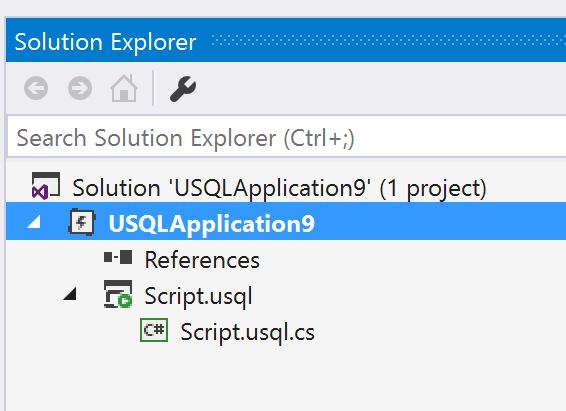 The solution contains single U-SQL project called USQLApplicationX. Inside that project is the empty Script.usqlfile. Notice that you can expand the .usql file node. It contains a C# file. This is called the U-SQL Code-Behind file. You will find this code-behind file very useful in later chapters. 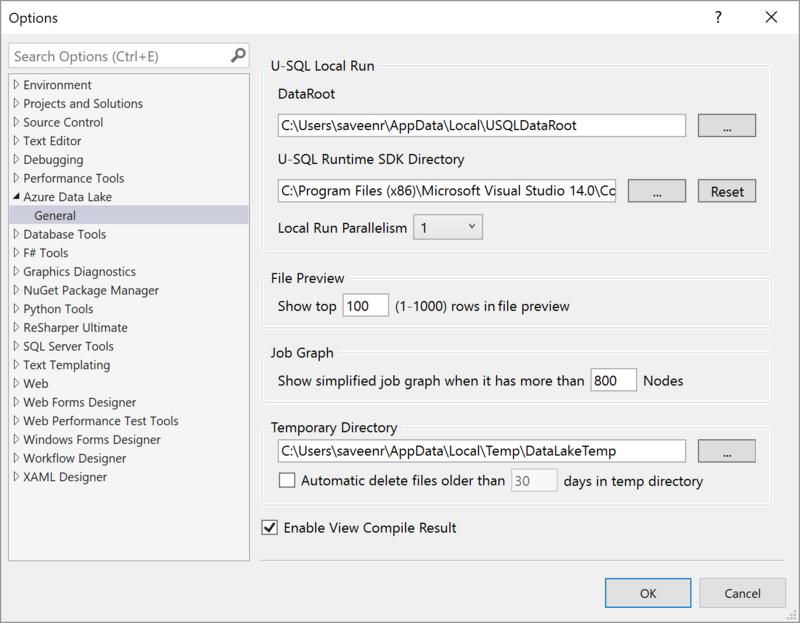 NOTE: U-SQL Code-behind is a convenience feature of ADLToolsForVS and not a part of the U-SQL language itself. Learning a programming language means learning how the compiler tells you something is wrong. Press Submit to run your empty script in Local Execution mode. You should see the Error List window appear and a single error. Unsurprisingly, it complains of an empty script. It&apos;s worth noticing a few things about this error. CSC : this refers to the U-SQL compiler. USER: this means that the user (you) are the source of the problem. If it says SYSTEM it means something is wrong with the U-SQL compiler itself or perhaps the service. System errors are not very common - but it will be valuable later on to always understand the distinction between user errors (also called user code errors) and system errors. REMEMBER: compiling a U-SQL script requires that all the inputs must exist. We often describe this as "all inputs must be known at compile time". Later chapters will talk about this topic in more detail. During U-SQL Cloud Execution the inputs/outputs must all be in the cloud - typically this means Azure Data Lake Store. During U-SQL Local Execution the inputs/outputs must all be on your own box. There&apos;s a special name for this location: The U-SQL Local Data Root. You can find the local data root by going to Tools > Data Lake > Options and Settings. It in the field called DataRoot at the top. Copy that location and open it in Windows Explorer. Now paste the following script in to the Script.usql window. This script we&apos;ve just run is very simple - all it does is copy a file. However, there it introduces many interesting topics we will discuss. Visual Studio will show the Job Graph window and a Console window will open. The script should run successfully. After the script completes, look in the Local Run Data Root folder, you should see a file called SearchLog_output.tsv. Congratulations, you&apos;ve run your first U-SQL script! The script contains a number of U-SQL keywords: EXTRACT, FROM, TO, OUTPUT, USING, etc. U-SQL keywords are case sensitive. Keep this in mind - it&apos;s one of the most common errors people run into. The EXTRACT statement reads from files. The built-in extractor called Extractors.Tsv handles Tab-Separated-Value files. The OUTPUT statement writes to files. The built-in outputter called Outputters.Tsv handles Tab-Separated-Value files. We&apos;ll cover reading and writing to U-SQL tables in later chapters. Later, we&apos;ll also learn how to make custom extractors. From the U-SQL perspective files are "blobs" - they don&apos;t contain any usable schema information. So U-SQL supports a concept called "schema on read" - this means the developer specified the schema that is expected in the file. As you can see the names of the columns and the datatypes are specified in the EXTRACT statement. The first statement in the script defines a "RowSet" called @searchlog. RowSets are an abstraction that represents how rows flow through a script. Because it comes up so often, we should clarify one thing now: RowSets are not tables, or temporary tables, or views, etc. They imply nothing about how data will be persisted.